My handbag is sacred territory. It holds my life in it and that’s not even an exaggeration! 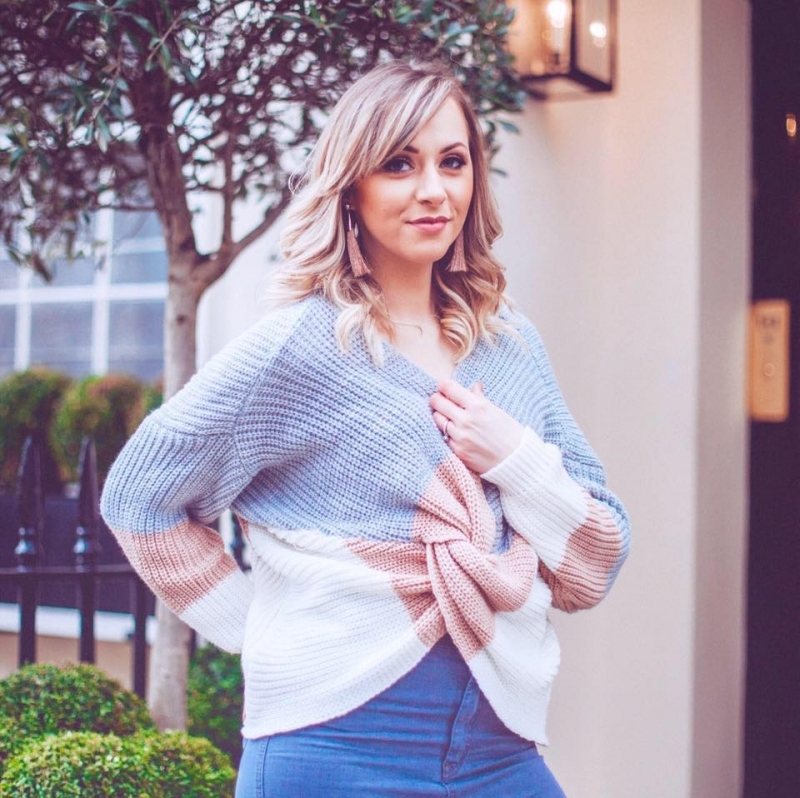 I live an extremely active life – I’m not talking mountain climbing on a daily basis, but I work full time, I’m a single mummy and between blogging, friends and general day-to-dayness, well, my life is busy! So, I need to always be prepared and covered for all eventualities which means my poor handbag houses practically everything from my massive can of hairspray to Disney themed plasters – most of which have fallen out of the box and live in the abyss at the bottom. I realised recently that most of the things I carry in my bag take up so much space and I don’t actually need full size everything in there. After lugging my handbag round the shops and coming home with shoulder ache from the weight of it again, I decided enough was enough and I started trying to find a way around having to carry a full to the brim handbag. That’s when I found out about Pinch Provisions. 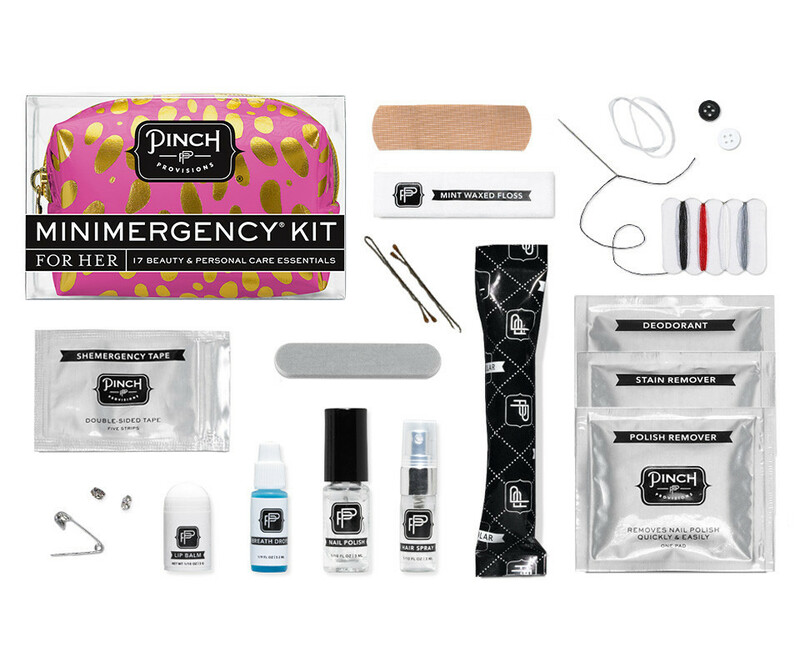 Pinch Provisions are an amazing brand who’s mini care kits are full of emergency essentials. Never heard of them before? Well they’ve just launched in the UK and I couldn’t be more excited! Welcome to the UK Pinch Provisions! 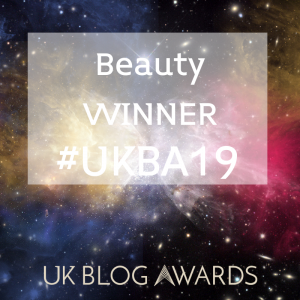 Their Minimergency kits have solved all of my handbag cramming problems and allowed me so much more space in my bag – no more achey shoulders from carrying the weight of all those things I have to keep with me. Their kits are tiny, and looking at them you wouldn’t believe that you get SO much inside something so small. You get 17 beauty and health essentials for those everyday emergencies that could potentially catch you out, and all come in the cutest and most fashionable little zip bag. 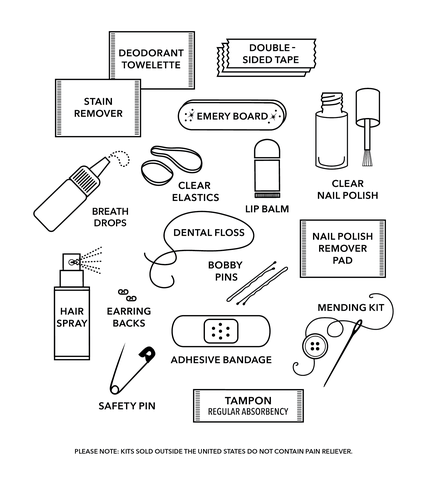 I can think of an occasion where I’ve needed every single one of these items and been caught short. I think that’s why I over cram my bag full of stuff – I don’t want that to happen again! But now I’ve got my Minimergency kit, I know I’m covered and I keep mine with me every day. Not only do they provide you with everything you need practically, they also have the most funky designs for the bags themselves. As you all know, I’m a huge Kate Spade fan, which is why my go-to Minimergency kit is white and gold stripes – it’s got that designer look to it, which I love. I’ve also got the fuchsia and gold, and that one is perfect for my more girlie days. Size wise, these will fit in to the smallest of bags – so you can even ensure that when you’re on a night out without your usual sized handbag, that you’re covered for everything. 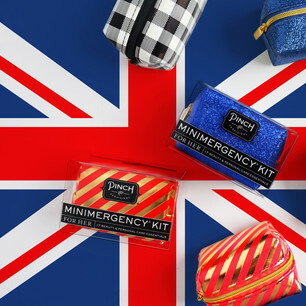 In fact, Pinch Provisions have a slimline kit too, for those nights where you’ve only got a tiny clutch bag. 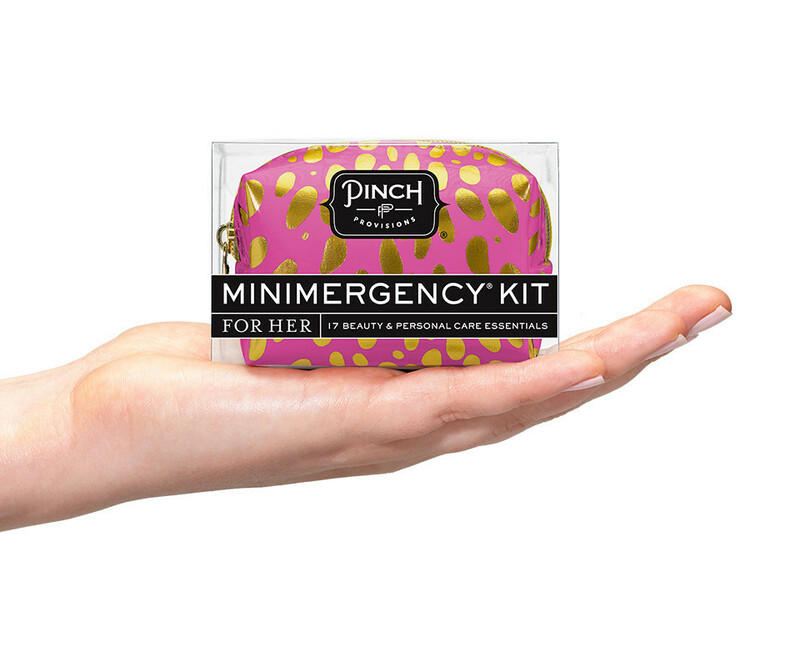 So there is no reason you can’t take your Minimergency kit with you whatever every occasion. The kits are only £16 each which I think is an absolute bargain for how much you get. There’s a huge range of coloured and patterned bags to pick from so there will be something for everyone, but the contents are the same inside them all – so you know exactly what you’re going to be prepared for. I have managed to replace all the heavy and bulky items in my handbag with one Minimergency kit and I’m so pleased – the kits are cute, handy, fashionable and practical and my handbag is no longer weighed down with full sized items that I don’t need in that quantity. Something new to the UK market, but I can guarantee these will take off as well here as they have done in the states – where they’ve sold over 2 million already. They’re just that unique.